The Arts Ecosystem Research Project (AERP) is an initiative of Seattle University’s Master of Fine Arts in Arts Leadership Program and Lemieux Library dedicated to researching, documenting, and sharing information on the Seattle region’s dynamic arts and culture sector. The focus is the arts organizations, businesses, and major events that have shaped the region’s unique cultural character, with the 1962 Seattle World’s Fair serving as a threshold event in recent cultural history. The first phase of research looks at the fifty years from 1962 to 2012. 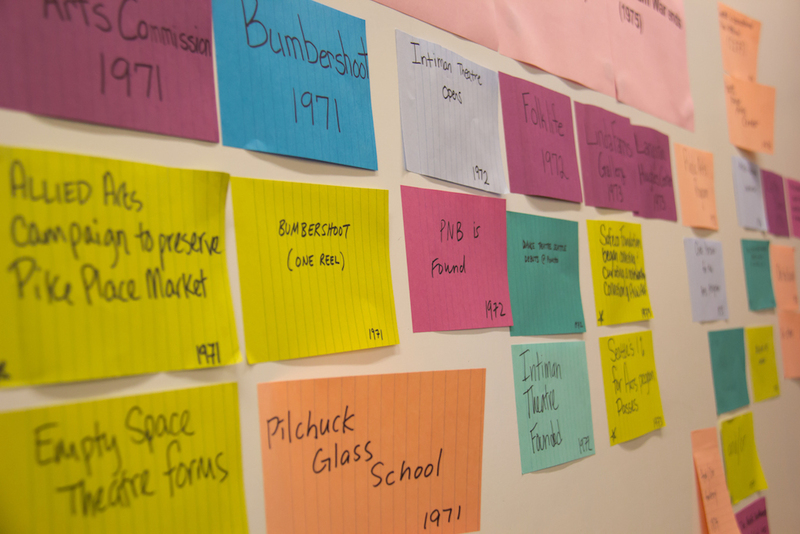 Data collected by participating MFA students provides the foundation for a digital Arts Ecosystem Timeline. Additional student research and related sources augment selected timeline entries via a digital repository. Data will be collected and added each year to the timeline and the repository. Collect information while many of the individuals involved are able contribute to the understanding, legacy, and lineage of this still young and vibrant arts ecosystem. Provide a foundation for a more nuanced and holistic understanding of the sector and set the stage for further research to inform the future of the arts sector here and elsewhere. Involve and inform future arts leaders though participation in applied research. The MFA in Arts Leadership at Seattle University requires students to develop applied research skills. Students enrolled in the program’s annual Applied Research Seminar actively contribute to the Arts Ecosystem Research Project. Fifteen graduate students in the inaugural Applied Research Seminar gathered data from arts leaders with the guidance of faculty and Advisors during winter 2018. The data identified noteworthy moments, seminal arts events, organizations, and businesses in the region for the initial set of entries for the digital timeline. Seventy-four arts leaders participated in the 2018 research. More than 200 potential entries for the Arts Ecosystem Timeline were identified, as well as information on the context and evolution of the sector. Students interviewed a total of twenty-eight arts leaders. This was a nearly 80% rate of response, reflecting strong community interest in contributing to this research project. Additionally, a total of seventy-one surveys were sent of which forty-six were completed -- an impressive 65% response rate. Respondents also provided more than 300 suggestions of additional potential research contacts, and numerous offers to participate in further research such as case study development. Students shared the results of their research with leadership from the Seattle Office of Arts & Culture and 4 Culture in a presentation. Practicums with graduate students continued through 2018 to organize the data and set the stage for the online resource and data gathering in subsequent years.